O2Optix, Renu MoistureLoc, Renu MP recalls and ClearCare shortages. Oh the frustration. If I had prescribed a patient O2Optix contact lenses and them told them to use Renu solution, that patient would be out-of-luck. 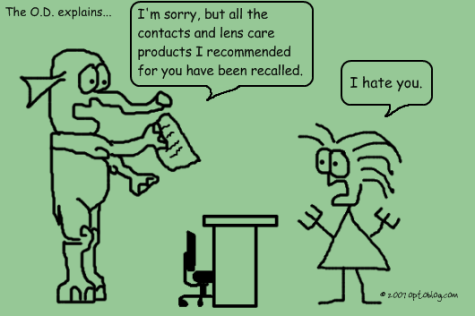 The opticals I fill-in at have had problems with patients who came in to order more boxes of O2Optix and were told they would have to be re-fit in another lens since the O2O is unavailable for the several months. Then, there was the day the recall came out, I had fit a patient in O2O and ordered the lens to be shipped to their house. Two weeks later they called wondering where their lenses are. Oops, sorry. That lens has suddenly become unavailable. So who gets the brunt of the patient frustration with these recalls? Not the manufacturers. It’s us on the front lines. Thanks a lot, you guys. This is my favorite cartoon so far… fortunately I don’t fit O2Optix, so life is good. Why don’t you fit O2Optix? It was my goto lens. Ack… missed your reply… 3 months later… not sure, just never got into it. I’m an Oasys girl, I guess. 😎 From Ciba, I fit mostly Dailies or Night & Days.